Cast iron is a superb material for cooking. It is extremely tough and durable, gets very hot and retains heat very well. It will last you literally for generations. Your grandchildren will likely be able to cook with your cast iron cookware if you take proper care of it to help it last that long. Luckily, it's not hard. Unlike other metals, cast iron is resistant to scratches, so you can be pretty rough with it and use any cooking utensils you like without worrying that you will ruin it. The problem with cast iron is that it is susceptible to rust, so needs to be cleaned and maintained properly. Ideally, you need to clean and season it without soap after every use. If you neglect cleaning it or simply don't use it for a long time, rust can build up. If rusty grill grates sit around for really long periods of time, the rust can eat into the cast iron so they become unusable, but that takes a long time to happen. In most cases, cleaning cast iron grill grates is rather easy. After cleaning, the grates need to be reseasoned to prevent future rust build up. To remove rust from cast iron grill grates, all you need to do is give them a good scrub. Remember: Because you don't need to worry about scratches, you can use any abrasive scrubbing tool, such as wire brushes or steel wool. Sometimes, rubbing the grates with an abrasive tool will be enough, but other times, you'll need the help of a cleaning solution to help you along. Rub the grates with vinegar and allow them to sit for a few minutes to an hour. The vinegar will dissolve the rust, making scrubbing more effective. You may need to repeat this process a few times. You can also use a paste made of baking soda and water. Like with vinegar, rub the paste into the grates and allow to sit for some time. Scrub after that. Repeat if necessary. After you've cleaned your grates, you need to re-season them to prevent future rust buildup. Cast iron seasoning is the process of oil being baked into the pores of the material at high temperatures so that a thin coating is created. This coating makes the cast iron non-stick and prevents rust build up. To season the grates, rub them with a very thin layer of vegetable oil and place them on the heated grill for a few minutes or until the grates are completely heated. Depending on how much scrubbing you've done, you may need to repeat the process. Rub with oil again and heat up until a good layer of coating is formed. If you have enameled cast iron grates, you're in for some good news and some bad news. The good news is that because they're covered with porcelain enamel coating, they don't need to be seasoned and are naturally non-stick. The coating also protects them from rust. The bad news is that your grandchildren may not be able to cook with your grill after all. If the enamel coating chips off, it cannot be repaired. Most companies advise against using the cookware if the coating has been chipped off. The reason is that if the coating keeps chipping off, it may end up in your food. 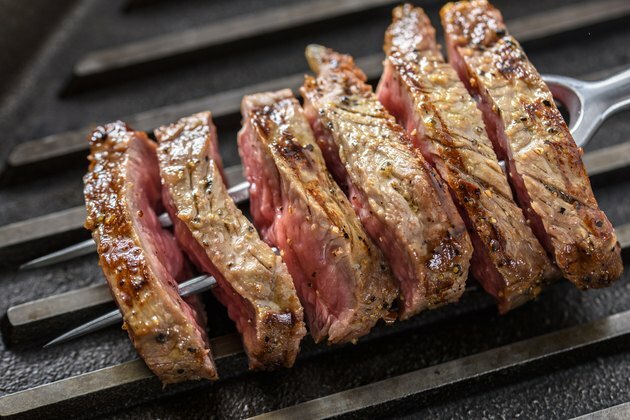 Not the best seasoning for your steak, let's face it.